Should I regurgitate the Heisman Trust's mission statement to you? Should I stand on a soapbox preaching integrity? Should I blindly ignore every allegation swirling around our top candidate? Should I ignore what could and has happened in the past? The 2010 Heisman Memorial Trophy winner will no doubt come with more than just a piece of hardware. If you're Cameron Newton, the prolific Auburn signal caller, are you just that? Or are you the player who made two SEC programs bid for your services? If you're LaMichael James, Oregon's 1,500 yard rusher, are you good enough to be more than just another athlete charged with domestic violence? If you're Justin Blackmon, Oklahoma State's stud wide receiver arrested for DUI on October 27th at 3:45 AM, is your 17-touchdown season enough to overcome your poor off-the-field judgement? If you're one of the three squeaky-clean quarterbacks remaining, TCU's Andy Dalton, Stanford's Andrew Luck, and Boise State's Kellen Moore, are you prepared to accept a Heisman Trophy with a less impressive resume on the field, yet a clean one off? This is the reality we live in. Less than three weeks from Heisman night, and we don't know where to go. Are you really innocent till proven guilty? Of course not, this is America. You're guilty till proven otherwise. And so goes the Heisman candidacy of Cameron Newton, the Auburn super quarterback with a season for the decade. The player who out dueled Tigers, Gamecocks, Razorbacks, Bayou Bengals, two sets of Bulldogs, Rebels, and gets a shot at 'The Tide,' won't factor. As accusations of improper benefits to Newton's family swirl, so does a season which saw him record some of the more mind boggling statistics in SEC history. His game doesn't pass the smell test, flat out. Wether or not Newton's family took advantage of his second shot at Division I football, it's too close to call. Within twelve months of revoking our 2005 Heisman Trophy (given to USC's Reggie Bush) for the very same accusations, the Heisman Trust will not risk the same embarrassment. Cam Newton may have thrown for 21 touchdown passes while running for another 17, setting records all the way through, but one thing he won't do is raise the most prominent award in collegiate athletics. Does Oregon's LaMichael James make you feel comfortable? With that out of the way, who's next?!? The Ducks are undefeated, they're about to be the PAC-10 Champions, and above all they have running back LaMichael James to thank for that. James has been the most dominant running back in college football throughout the 2010 season. The 2nd year sophomore from Texarkana is repeating his freshman year success. Closing in on 1,500 yards, while sitting out the first game of the season due to suspension, James is again set on breaking records. Heisman winners come to play on the biggest of stages, right?!? 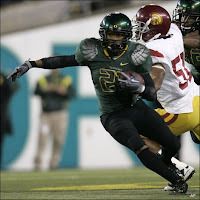 In LaMichael James two biggest games this season, against both Stanford and USC, James rushed for 496 yards and six touchdowns. Blow out your candles, there's only one player this side of the Mississippi that can hold a dimly lit flashlight to Cam Newton, that player is LaMichael James. Unfortunately for you and I, James was arrested earlier this year on charges of domestic assault . That's the guy you feel it's appropriate to make a call of character on?!? 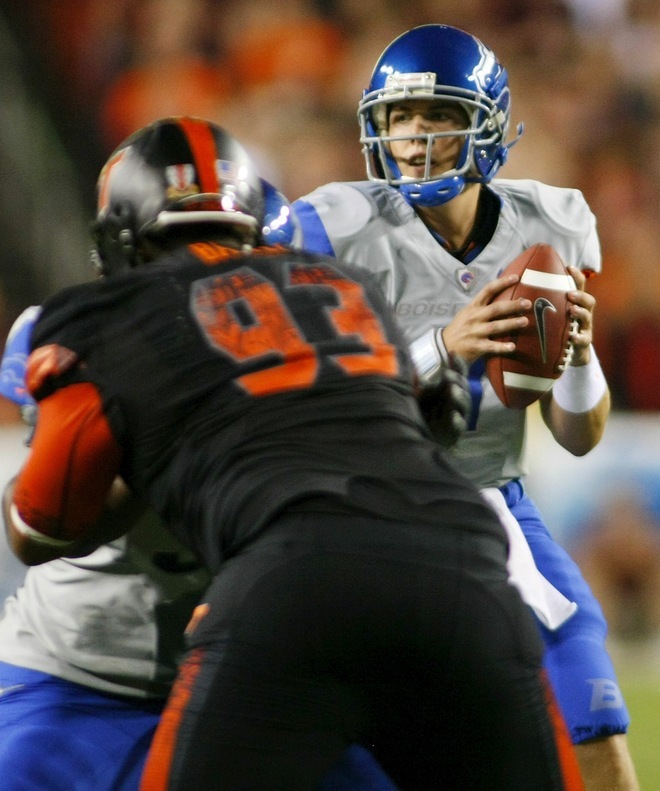 Is this where you reward Boise State, more specifically, quarterback Kellen Moore? Allow me to preface this by saying Stanford's Andrew Luck deserves to be in New York on December 11th - 2,746 yards passing, 24 touchdowns, 7 interceptions - impressed? 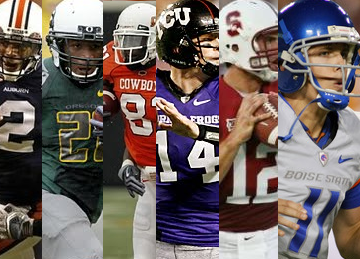 Back to Boise State's Kellen Moore. 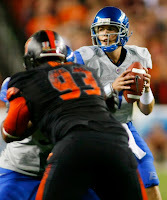 Closing in on a 3,000 yard, 30 touchdown passing season, Kellen Moore is the nation's premier collegiate quarterback. Like both Newton and James, Moore's Broncos have yet to lose a game in 2010, but Moore has been down this road before. In Kellen Moore's three seasons as a starter at Boise State, a span of 37 games, including bowl games, Kellen Moore is an astounding 36-1. He hasn't lost since 2008, he puts up all the numbers you want from a Heisman winner, and he passes the integrity test. So why not him?!? Chew on this while you ponder that question: Would you really want to saddle a player of Kellen Moore's quality with being the recipient of a circumstance Heisman Trophy?!? The Heisman winner due to being the only candidate able of keeping his name in box scores rather than police blotters? That's the question you're going to need to answer. Wether it falls the way of Boise State and Kellen Moore or the Heisman Trust gives it to the best player in the country, either Cam Newton or LaMichael James, this Heisman Trophy has the cloud of controversy swirling heavy. For more Lynchy . . Twitter & Audio Lynchy!